At the end of the day, one doesn’t always have the energy to muster up a gourmet meal. 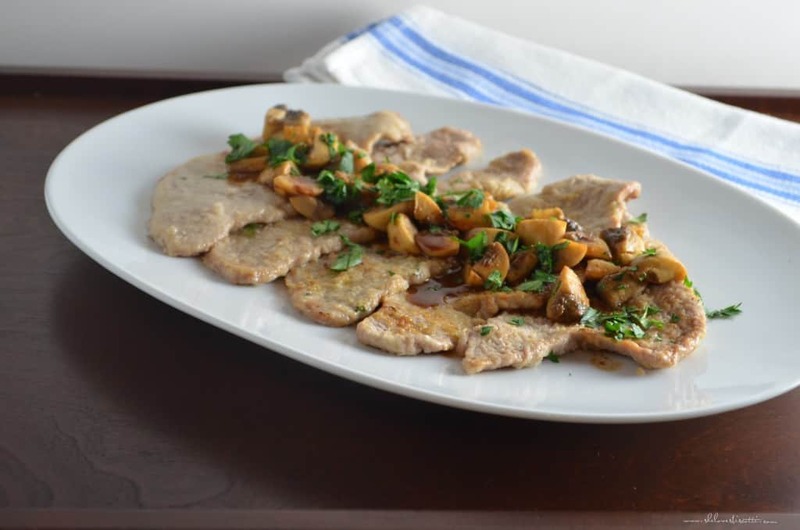 I would like to share with you one of my favorite meals to prepare in less than 20 minutes – Lemon Veal Scaloppini with Mushrooms. This recipe also works extremely well with either thin slices of chicken or turkey, if veal is a little expensive for you. The use of Italian flat-leaf parsley is a must in this recipe. It provides a robust flavour that is lacking in its curly counterpart (i.e. curly leaf parsley). Fortunately, even in the dead of winter – which seems never-ending this year – the flat-leaf parsley can easily be found in your grocery store. Always remember to properly rinse and then give it a whirl in your salad spinner. This will prevent the leaves from turning dark when they get chopped up. As I have previously mentioned, I absolutely love the freshness of lemons in either sweet or savory recipes. (If you are a lemon lover, you have to try the recipe for Extra Moist Lemony Lemon Loaf). 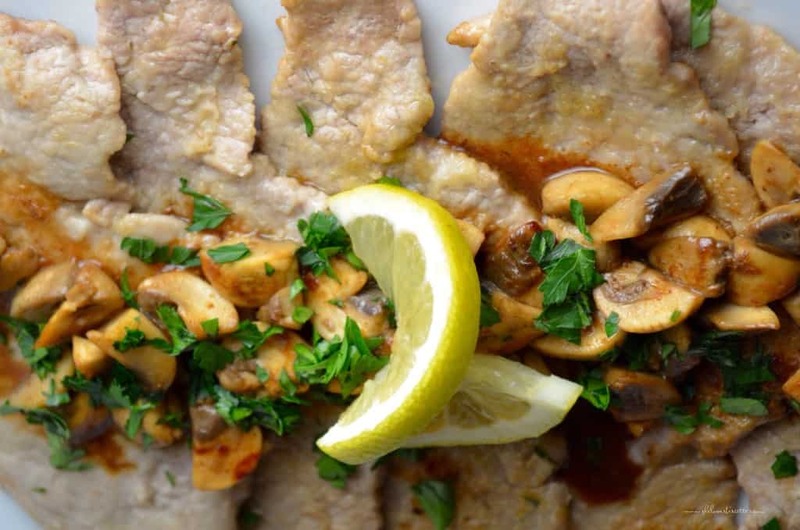 You will notice there is lemon juice in this veal recipe. 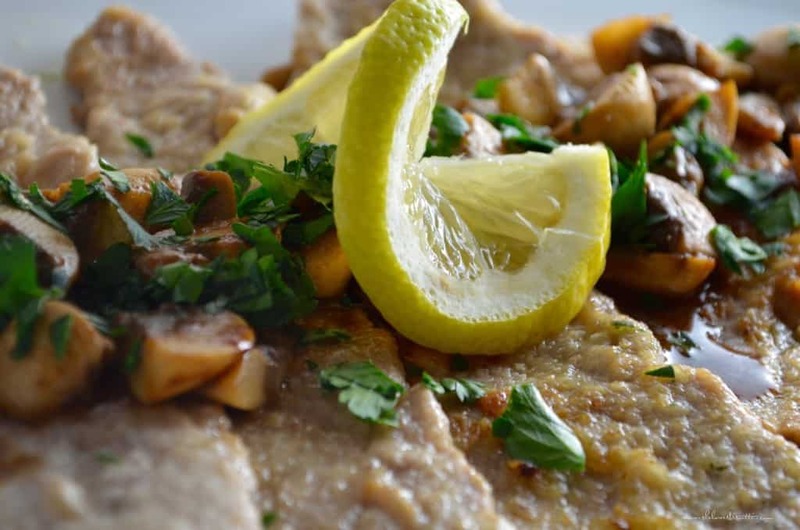 I usually squirt another tablespoon (or more) worth of lemon juice on top of the veal, at the table. Lemon juice, as you probably know, is really a great source of Vitamin C, so make sure you squirt! My Mom would often make her own variation of veal scaloppini. 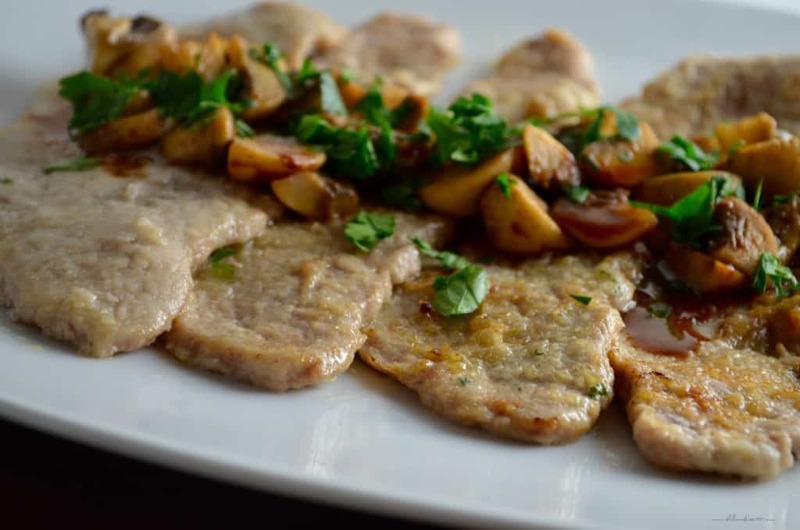 In case you’re wondering, the definition of scaloppini is a thin cut of meat (in Italian it’s spelled scaloppine). You should always pound your meat with a mallet in order to get it as thin as possible. If you don’t have a mallet, you can always use the bottom of a frying pan to whack your meat. (Remember Disney’s Tangled? Frying pans, who knew, right?) I’ve taken the liberty of adding mushrooms to the recipe, just because we all love mushrooms in my family. Serve your lemon veal scaloppini with mushrooms alongside some steamed broccoli and egg noodles. A gourmet style meal ready in less than 20 minutes, What can be simpler? 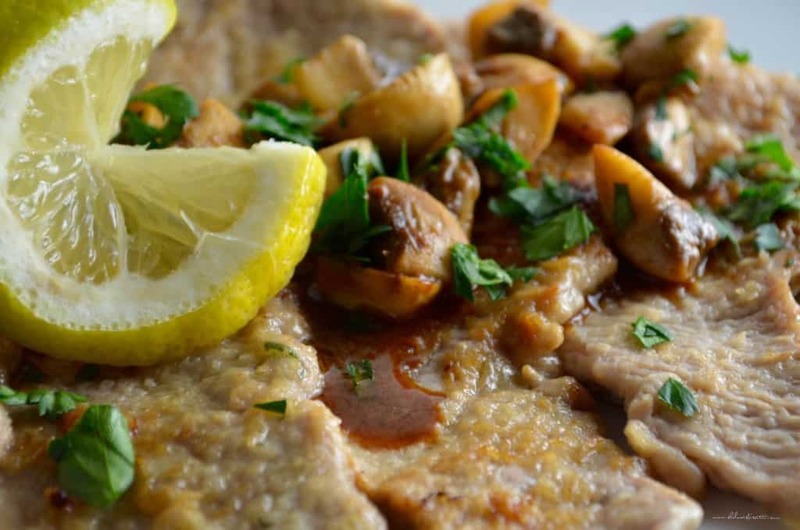 Less than 20 minutes are required to prepare this gourmet meal- Lemon Veal Scaloppini with Mushrooms. Pound veal slices to approximately 1/8 of an inch. Combine flour, salt and pepper in a large plate. Coat veal slices with the flour mixture on both sides and shake off excess. Over medium-high heat, heat 1 tablespoon of oil and 1 of butter. 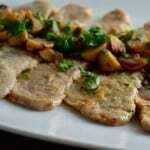 Cook veal (in batches) very quickly in hot pan for approximately 2 minutes per side or until golden brown. Transfer to warming dish and transfer to a warm oven. Once all the veal has been cooked, add the wine, scrape bottom of pan and simmer until slightly reduced and thickened. Add lemon juice and continue to reduce and thicken. Remove from pan and set aside. (This should take just a few minutes). In the same pan, drizzle about 1 tablespoon olive oil and sauté quartered mushrooms until golden. Add reserved wine/lemon sauce and parsley to mushrooms and heat through. If desired, garnish with more parsley before serving.